One of the things I love to see in a picture book about Indigenous peoples is a visual that puts the story and its teller in the present day. 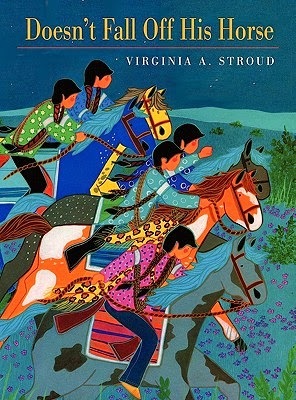 Virginia A. Stroud's Doesn't Fall Off His Horse does that beautifully. The first page from Stroud's book is to the right. See the little girl? See the wallpaper on the walls? See the glass windows in the house? To a good many of you it might sound ridiculous to point out those things, but there are so many people who think Native peoples are long gone, or if we're still here, that we live exactly like we did several hundred years ago. Some even think that if we do NOT still live that way, that we can't be "real" anymore, as if being Native is about material culture and nothing else. We're far more than that, of course. Every culture or nation or ethnicity is more than its material culture. Stories, for example, are an unseen part of a people's culture. In Doesn't Fall Off His Horse, Stroud tells us a story about her grandfather. Specifically, it is a story about how he got his name. "but which one? He was like a living book; nearly a hundred years had passed under his footsteps during his walk upon the earth. He had followed the buffalo, he had roamed the open plains with tepee and lodge poles, he'd seen the non-Indian wagons come to Indian Territory and watched from a hilltop as the settlers staked out the land. He saw one of the first locomotives cut across the prairie, then an automobile, and an airplane; he had received the citizenship given to the Native American people." Sensing she wants a story, he says "Doesn't Fall Off His Horse." Saygee asks him who doesn't fall off his horse, and he says "Me." and "That's my Indian name." From there, he begins this thrilling story. In its telling, we learn that he is Kiowa. I chose that excerpt (above) quite deliberately. Another thing I look for in a children's book is a way of telling that sounds like the people I know. I don't know any Native elder--or any Native person, in fact--who calls a train an "iron horse." I've seen non-Native writers put that phrase in the mouths of their characters, or, in their stories, but I don't think it originates with any particular Native people. I highly recommend Doesn't Fall Off His Horse. First published in 1994 by Dial Books for Young Readers, it is also available in ebook format. Sheesh. The activities that let people figure out what their Indian name is, or what their spirit animal is, are so freaking bogus! So many assumptions and ignorance go into their making. Let's look at WHAT IS YOUR SPIRIT ANIMAL, created by Brieanna Watts Elmore (if that is a real name/person) at Buzzfeed. It assumes, for starters, that we are monolithic, that no matter where our homeland might be, we think the same way about salmon. And buffalo. And wolves. Fact? We don't. We're over 500 distinct nations, located across the US. We don't speak the same language. Our traditional clothing differs. And so do our spiritual beliefs! Some of us have clans associated with animals but not all of us, and, frankly, I know a lot of Native people from a lot of different Native Nations, and nobody has ever said to me "my spirit animal is..."
I think that "spirit animal" thing is the White Man's Indian. But gosh darn! So many people (who don't know better) love love love the White Man's Indian. It is in a lot of children's and young adult books. Case in point? Neal Shusterman's Unwind dystology. I'm (grudgingly) reading Unsouled right now. One of his main characters (Lev) has just figured out that his spirit animal is a kinkajou. Some people--including Shusterman--tried to persuade me that he's doing a good thing with his Native characters and content (like this spirit animal stuff). He means well, just like the person who created this ridiculous Spirit Animal quiz at Buzzfeed. But!!! Good intentions don't matter. The quiz isn't harmless. Neither is Shusterman's book. Perpetuating and affirming ignorance doesn't do anyone any good. If you found yourself taking that Buzzfeed quiz or if you found yourself liking Shusterman's Native content, but this post makes you think otherwise, push back on The White Man's Indian. Reject it and tell others to reject it, too.